Nestled in the beautiful South Hams countryside is Foxcove campsite. A quite secluded campsite overlooking the Yealm Estuary surrounded by fabulous woodlands. It is accessible by road, foot and is a stones throw away from Wembury in Devon. That will make you want to come back again and again! Foxcove offers fabulous indoor and outdoor camping with the added luxury of having all the facilities on site. Booking the site and checking availability can be done online or via our booking secretary. 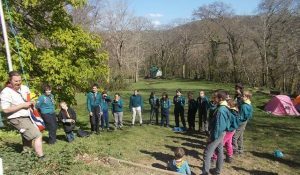 We can offer a back to basis camp right through to a patrol and District camp, this site has it all. But you can also have the use of the buildings as a great base, to run all your catering needs. Complete with our flag pole up by the main building. The site is open for use by all Scouts, Guides, Youth Groups, Schools and registered Organisations from all over the UK and abroad. If you have any questions, or would like to arrange a site visit, please contact us and we will be happy to help.